Nicula Monastery in the morning we arrived in the middle of winter one day. Maybe that's why some of the road to the sanctuary was wound through a dense fog, the buttermilk until the houses lining it when I passed through the village of the same name.But when we got up to the monastery, we encountered strong sun, but also a magical sight, because I was out of the dense fog that stretched now as large valley between the hills. I lingered too long on pictures, but we quickly went to church with miraculous icon, where I learned the history of it, one full of adventures, like the surrounding ground. I learned so Nicula Monastery, one of the monasteries in the Romanian area, dating from 1552, was school "soul care and teaching of infants" in 1659 and center of spirituality and culture, is a place of pilgrimage and painting workshop glass since 1699. In 1326, Nicula was a forest that has forced Nicholas Orthodox hermit, from whose name was later baptized forest, village and monastery. 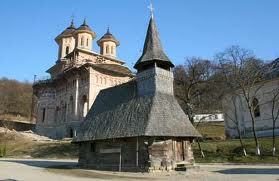 The first historical evidence proving monastic settlement is related to the presence of a wooden church in Maramures style, dedicated to the "Holy Trinity", dated 1552. In 1659 and the school became "royal" which taught children in villages around the monastery, monks accounting for the mission teachers. Between 1712-1714 the church was renewed, but will fall prey to a fire and replaced with a wooden church dating from the seventeenth century, moved here from the hamlet NASAL - fanatics.Since February 15, 1699, Nicula is a special place, especially Mary, for her icon, painted by Luke the Iclod Orthodox priest in 1681, he would cry for 26 days as a foreshadowing of the sad events that will take place around 1700, for the monastic life, and especially for all Romanian Orthodox of Transylvania. From that moment Mary would become the hope of deliverance from slavery, disease and needs, the faithful are accustomed to come on pilgrimage every year, on foot, by caul, singing: "I'm his mother see you, to tell you that we've got trouble! "Priory was built between 1978 and 1989, housing a chapel dedicated to "St. Nicholas" and an important collection of ancient icons painted on glass and wood, and a collection of old religious books including "boiler" Metropolitan Barlaam, printed in 1643.The monastery has but, as I said, a troubled history, which also houses the icon. Pope Clement XIII in 1767 granted a plenary indulgence to pilgrims visiting the Monastery Marian feasts Nicula in August 15 - Assumption of Mary - St. Mary High - and 8 September - Nativity of the Theotokos - St. Mary Minor.Stone church of the monastery was built between 1875 and 1879 at the expense of the Diocese of Gherla and interior painting was done in tempera by Professor Basil Pascu in 1961. The iconostasis is carved in a wood adorns the lime of Samuel Keresteşiu of Tăşnad in 1938 and is centered around the miraculous icon of the Virgin Mary. The form solar iconostasis is unique and rare beauty. In 1928 Pope Pius XI gave the Marian shrine sanctuary status.School through masters painters from the monastery Nicula into Transylvania glass painting technique, this custom having its origin in Bohemia, Austria and Bavaria, areas where manufactures glassware tradition blended with Catholic popular religiosity. In 1936 Bishop Julius Hossu the Diocese of Cluj - Gherla monks entrusted for safekeeping bazilieni icon of the Order of Saint Basil the Great. They placed it in lime wood iconostasis of the monastery church. Basil Chezan the father of one of the monks arrested in 1948, he received the Julius saved icon Hossu, building it into one of the walls of his house. In 1964, near death, refused to leave his home and prayed toward a wall, which made the Orthodox abbot of the monastery, Seraphim club to beat the wall and find there icon and a box of religious objects . The icon was brought to the monastery and only a few days was taken by communist authorities. At the request of Bishop Theophilus Herineanu Orthodox icon was placed in the chapel of the Palace Orthodox Archdiocese of Cluj. In 1991 it was restored at the National History Museum of Transylvania in Cluj, after which he returned to the monastery Nicula.In 1948 the Greek Catholic monastery was closed and bazilieni monks were arrested in October 1948, with the removal of the Romanian Church United with Rome outlawed. Leon Man monk, abbot of the monastery, was imprisoned by the communists and died in prison. On 18 December 1948 the communist authorities installed Nicula first Orthodox abbot in person Barachiel Jitaru monk, born in 1913 in the locality Pângăraţi, Neamt County.Following refusal to return Orthodox monastery monks, Diocese of Cluj - Gherla a process initiated since 1989 to recover the place of worship. Transylvania because courts could take the Greek Catholics, the case was moved to Bacau Court, which is pending now.Beyond dispute, monastery, especially miraculous icon of the Virgin Mary remains why thousands of believers from across the country gather here, whether it's a holiday or not, and like us, worship some prayers with hope and reverence .Now, when we were preparing for departure, the monastery began to fill with people coming down from the village, even if it was a special day. We no longer could linger, but going back to the car, we found ourselves back in the sea of ​​fog, though this time more beautiful, more successful in our photos, a sign that begins a blessed day.